Kirsten Dunst is a Hollywood actress, who became famous after was the lead actress in the worldwide blockbuster Spider-Man. But there are other significant Hollywood projects in the creative biography of the actress, for example, Eternal Sunshine of the Spotless Mind, Mona Lisa Smile, Jumanji, How to Lose Friends & Alienate People, Melancholia. The role in the last movie brought the actress the honorable Palme d'Or in the nomination Best Actress. Kirsten Caroline Dunst was born in the state of New Jersey in April 1982. Four years later a son, Christian, was born. Until the age of nine, Kirsten lived in the town of Point Pleasant. Her father worked in a medical company, and her mother was an artist. She painted pictures and owned a small art gallery. Both parents came from Germany. The mother was also of Swedish descent. Therefore, the daughter from an early age learned German as a second native language. When the daughters turned nine and the son was five, the parents divorced. Inez Rupprecht took the children and went to Southern California. Kirsten Dunst’s cinematographic biography started very early. The audience began to watch the development of her career when the baby was just three years old. First, an easygoing and cheerful girl appeared in some television shows, which were replaced by commercials and films. Kirsten starred in the movie for the first time at the age of six. Woody Allen offered her a bit part in the project New York Stories. After filming in this sensational movie, Kirsten Dunst moved with her mother and brother to Los Angeles, which certainly worked in her favor. Since 1989, the aspiring actress has started to climb the cinema stardom. At age 13, she starred in the movie Interview with the Vampire together with such famous stars as Brad Pitt and Tom Cruise. The same year, Kirsten was named one of People Magazine’s Most Beautiful People of 1995. At the same time, Dunst won her first Saturn Award. And she was also nominated for the Golden Globe. In 1997, the young actress received a bit part in the film, which today elicits no less interest than in the year of the premiere. This is a black comedy film Wag the Dog by Barry Levinson. The real Hollywood stars Robert De Niro and Dustin Hoffman starred there. To play with such masters was a great success. Since that moment, Kirsten Dunst has played in "adult cinema", where her images are mature and complex. These are the roles in Sofia Coppola’s drama The Virgin Suicides, and two Cameron Crowe's films Almost Famous and Elizabethtown. In 2002, the top-grossing film of the year Spiderman was released, which brought Kirsten Dunst not only profit but also real fame. It is interesting that Kirsten Dunst was almost higher than her savior and superhero Spider-Man. The actress’s height is 170 cm, and Tobey Maguire is 173 cm. Two years later, the sequel to the film appeared, according to its ratings and popularity, it exceeded the first part. In 2004, the actress played a support role in the film Eternal Sunshine of the Spotless Mind. It was the first film, where viewers saw naked Kirsten. It was followed by the melodrama Mona Lisa Smile, where Dunst appeared on the screen along with Julia Roberts, the romantic comedy Wimbledon and the historical melodrama Marie Antoinette. This is Sofia Coppola’s second project, and Kirsten Dunst was offered a role in it. 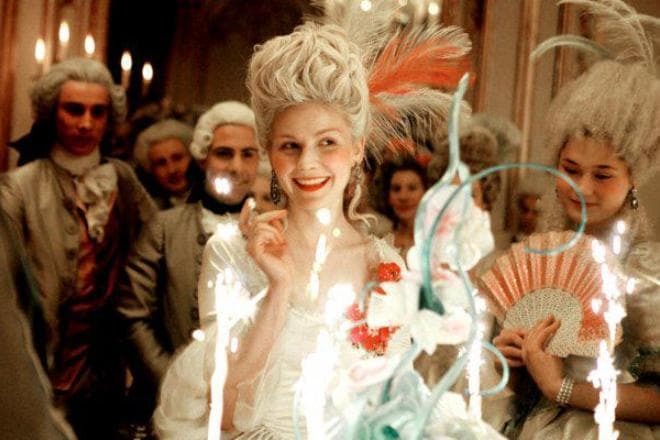 Kirsten played the leading role of Queen of France Marie Antoinette in this biographic movie. The film showed the life of the Queen from 14 to 33 years, combining the noble lady’s way of life, and the country on the edge of the revolution. Kirsten Dunst played the role of the queen in all episodes, regardless of the age of the heroine. 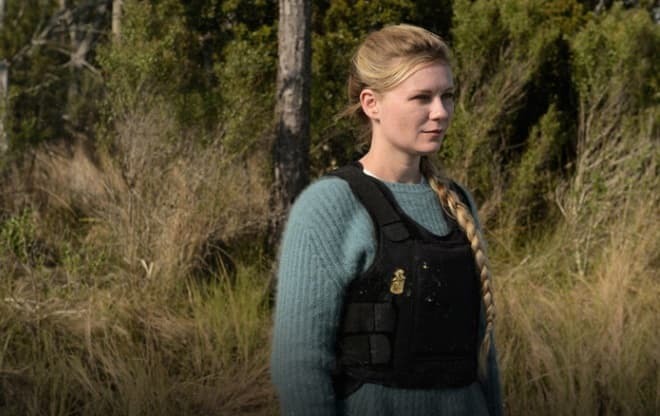 In February 2016, the actress appeared in the sci-fi thriller Midnight Special, where Kirsten Dunst played the mother of a child with paranormal abilities. The family is forced to run away from government agents and sectarians, who have ranked the gifted child as the God. In March of the same year, the actress played in the film Hidden Figures, which the U.S. National Society of Film Critics ranked the top ten films of 2016. In May 2016, the press found out that the actress had changes in her professional life. Kirsten Dunst was going to make her debut as a director. The actress began shooting the movie The Bell Jar. Dakota Fanning got the main role in this film. The filmography of this charming actress is as rich and extensive as her personal life. The mass media covered more than a dozen imaginary or real love affairs with famous colleagues, sports, and music stars. There are rumors that Dustin Hoffman liked her on the set of the movie Wag the Dog. He even decided to introduce her to his son Jake. But young people appeared together in public only a couple times. A year later, Kirsten met Josh Hartnett on the set of the film The Virgin Suicides. They were together for almost a year. But, it seems, their relationships were more friendly than romantic. In 2001, there were talks about Kirsten and Jake Gyllenhaal’s love affair. Then the beautiful woman was seen together with actor Ben Foster and the singer of Phantom Planet Alex Greenwald. Journalists were lucky to take pictures of Kirsten and Alex kissing a couple times. But later, the careless beautiful lady put that love affair to an end. After all, Greenwald was replaced by colleague Tobey Maguire, with whom Dunst played in Spider-Man. Kirsten Dunst’s rich personal life and the equally busy professional one, apparently, caused the deep depression in 2008. She even had to go to the clinic, since she could not cure herself. 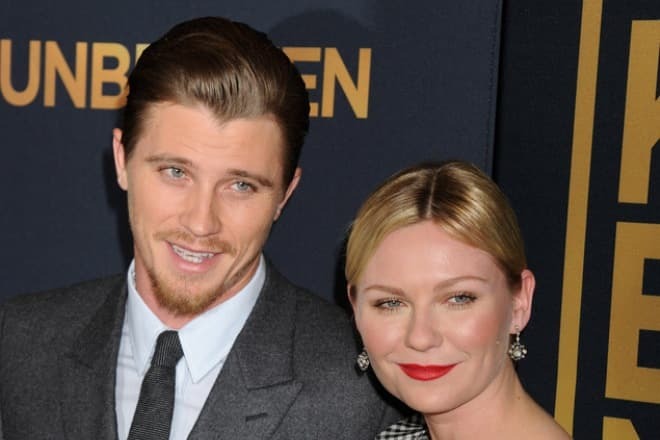 In 2012, Kirsten Dunst began dating with colleague Garrett Hedlund. But in the spring of 2016, the couple announced their breakup. Kirsten Dunst was not alone for a long time. The same year, the paparazzi found out that the actress had a new relationship. 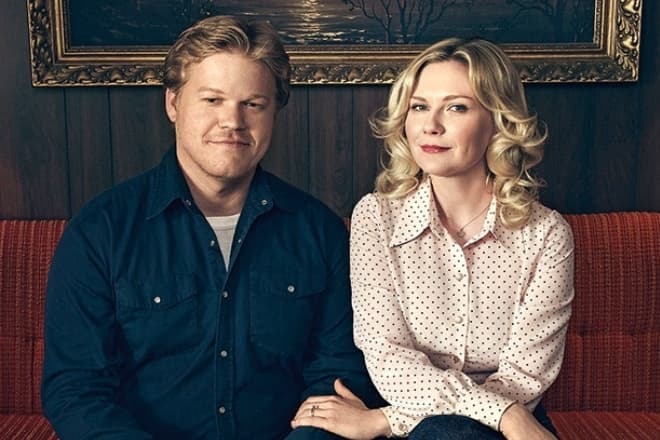 Kirsten began dating with a colleague on the TV series Fargo Jesse Plemons. The actors played a couple in love in the second season of the series and brought the warm relations into life. Subsequently, the actors officially confirmed that they were in the relationship, and also announced an engagement. Despite the decision to start a directing career, Kirsten Dunst continued to act as an actress. In 2017, Sofia Coppola’s new film The Beguiled was released, where the actress played the role of a teacher in a girls school in Virginia. The plot of the movie takes place during the Civil War in the US, thus, there are only a teacher and five pupils who find in the woods and take care of a wounded soldier (Colin Farrell). In September, the premiere of the drama Woodshock with Kirsten in the lead role took place. 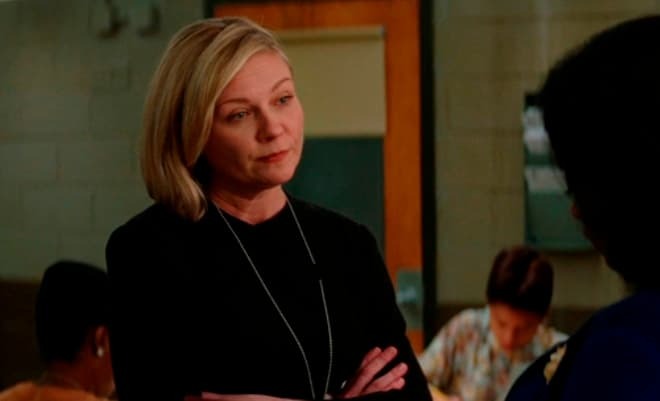 The actress played the role of a girl who sold marijuana and, at the request, could mix a special staff with drugs that helped a person die peacefully. In December 2017, the attention of fans and the press again switched from the work to Kirsten's personal life. There were rumors that Dunst was pregnant and the couple was expecting the first child. Journalists referred to Us Weekly magazine, who found out this information from the actress’s loved ones, as well as from photos that show Kirsten Dunst in a baggy dress hiding her belly. But at that time, the actress did not comment on these rumors. In January 2018, the actress starred in the commercial for the Rodarte autumn-winter collection. Kirsten Dunst did not hide her baby bump in the photo, and the light pink dress only emphasized the state of the actress. Designers used flowers instead of jewelry, and the general atmosphere of the pictures was in a fairy-tale style.